If you're looking for stylish gift for a tea or coffee lover this Christmas then you'll love the new limited edition printed tableware designs from Portmeirion featuring fashion-inspired floral designs from Ted Baker. 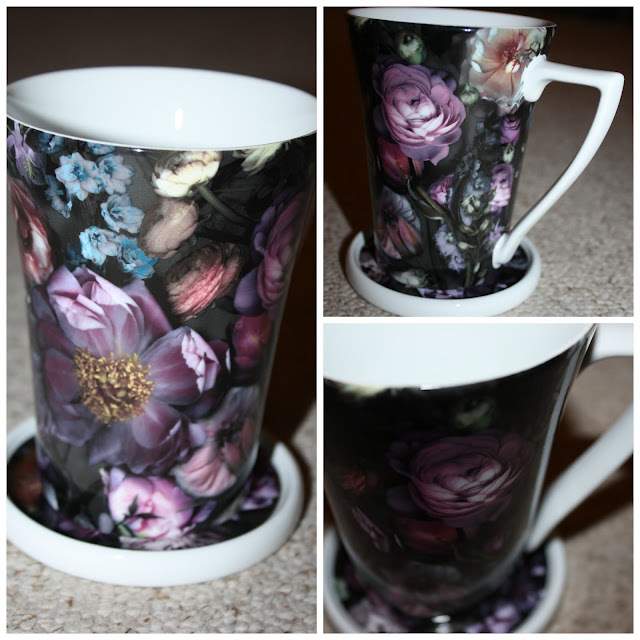 I was sent a really smart china mug and coaster from the Shadow Floral range which features deep, dark pink, purple and blue flowers but with a delicate white interior. The mug is a shape suitable for either tea or coffee. I love the little coaster that it comes with - it means I can claim this coaster as my own and not have to search around the living room for one of the main set of coasters that the girls insist on moving! Alongside the shadow floral design you can also find a technicolour bloom which has reds, whites and teals among the floral flashes. The new Portmeirion Ted Baker range also includes a set of two stacking mugs, and a set of two floral plates (20cm). They are available to buy in John Lewis, House of Fraser and online at www.portmeirion.co.uk.